Good thing I didn’t try to stay there, because when I reached it after a steep climb it is completely closed. 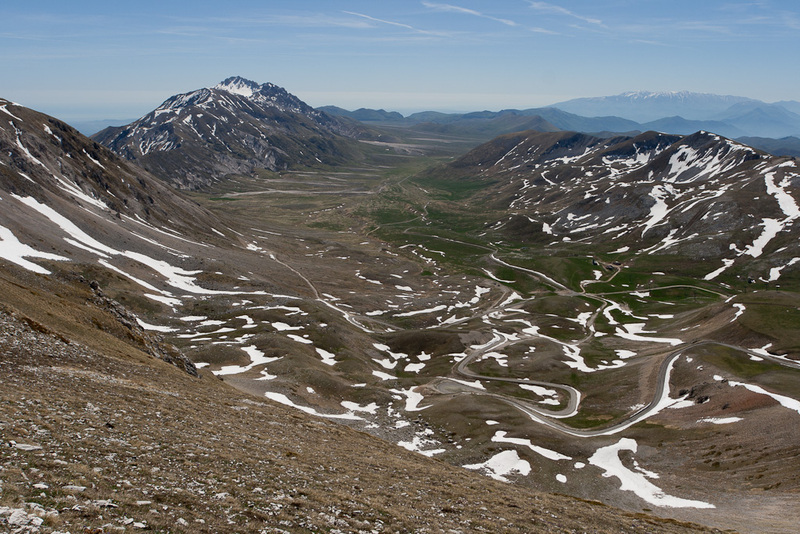 But the view was fantastic and I could see L’Aquila, Assergi and the entire Campo Imperatore at my feet. Because it is right there I quickly climbed Mt Portella, an easy peak to bag at 2385m. From there I worked my way to the saddle with Mt Aquila and bagged a few unnamed tops on the way. More out of necessity than peak bagging desires: the track is snowed under in places and in trying to cross one it became so perilous that I abandoned that idea and retraced my steps, climbed higher and instead opted for the ridge line to get to the saddle. This is not the place to get myself into trouble. It also showed why there is no way that Corno Grande can be climbed at this time of the year unless you are equipped with trekking poles, crampons and ice axe and have done it before. This is tricky terrain. When I got to the saddle, I eyed off Mt Aquila. It didn’t look like a difficult climb, but it is a way up still and the descent will be hard on my knees. Looking at the descent ahead me I knew the wiser option is to forego the peak and make sure my knees are strong and steady for a slippery traverse through snowfields down the side of a steep mountain. Safely back at the hotel I ensconced myself on the terrace with laptop and book and basked in the sun. The afternoon got exciting when a helicopter flew in offerring sightseeing flights. It being Saturday there are quite a few people visiting; a lot of people on motor bikes, out for a ride, and others by car. They do a bit of business, flying in and out until they finally depart towards 5pm. And so we get to today, Sunday. After checking out of the hotel I was hoping to take the cable car down to Fonte Cerreto, to save my knees on a steep descent. But in typical Italian fashion there is no one there and after waiting for quite a while with the weather gradually closing in, I decide I better make a move and walk down the mountain instead of waiting around for something that might never happen. The track is a steep zigzag down the mountainside, but I take it slow. Only during the latter part do I slip a few times on the gravel. Obviously the muscles are getting tired. I reach Fonte Cerreto in an hour and forty minutes, which is not bad going when you consider I’ve descended a 1000 vertical metres. As I write this the clouds are rolling down the mountains quickly and it won’t be long before it will rain. I’m glad to have a roof over my head for the night. If it’s really bad tomorrow I can always stay another night. Fortunately I had left before the quake happened. Looks like I was out of Italy just at the right time and a good distance away from it now, which is just as well. Sad to see it happened again though.